Seismological Research Letters, 89 (4), 1566-1575, https://doi.org/10.1785/0220180021. Abstract: This article describes a database that provides various catalogs of slow earthquakes. The catalogs list the times and the locations of the events, with additional information depending on the catalog. Because these catalogs are provided by a variety of documents in different formats, previous studies that use them must repeat complex procedures for preparing data. 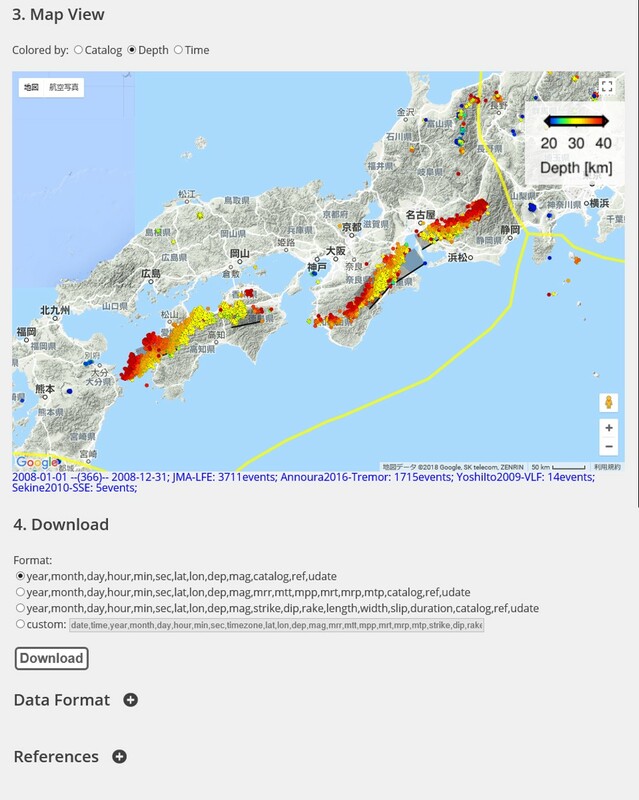 To make it more convenient to use multiple catalogs and promote research on slow earthquakes, we compiled a number of catalogs into a standardized format in a single repository, the Slow Earthquake Database, at theUniversity of Tokyo (see Data and Resources). Users can visualize the source locations of multiple slow earthquakes in the database in map views on the website. Convenient access to the database encourages researchers to work on slow earthquakes regardless of their backgrounds. We also expect the database will foster collaboration among researchers in various fields and further the understanding of the mechanisms, environmental conditions, and underlying physics of slow earthquakes. Through the compilation of this database, we established a global standard of slow earthquake catalogs.